Luckily, the folks at the Good Dog Bar and Restaurant in Philadelphia have that deft hand. I've been to the Good Dog several times before, and they've never disappointed, so getting a plate of scallops would be a good way to test their mettle- it's a simple dish, but simple means there is no margin for error. The folks at Good Dog hit the ball out of the park. My scallops were perfectly seared, with enough seasoning that I got a nice little pop of black pepper, but not so much that it overwhelmed the subtle, light flavors of the scallop itself. That little bit of crust gave it a touch of mouthfeel to bite into, and the rest was tender and buttery in texture- juicy and cooked through, but not rubbery at all. 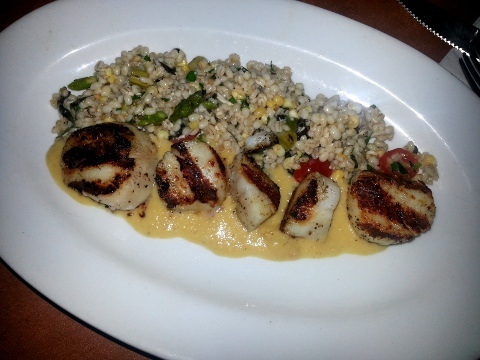 The scallops melt in the mouth, just like they should. Since Scallops have a fairly subtle flavor, it is very easy to overwhelm them. The sweet corn puree under them was a very smart choice. It added a little sweetness, and a little contrasting texture, but was still light enough that the scallop remained the center of attention. The barley salad played a similar role- yet another textural change with light flavors. The vegetable bits blended in perfectly, and the whole affair was dressed with a light vinaigrette that gave the salad an almost pickled feel. The acid tang was again, light enough to stay in balance, allowing the salad to be enjoyable on it's own, without taking the attnetion away from thosenicely cooked scallops. Great blog written such a nice and informative content shared here for us. Thanks and keep sharing more like this. hey,I really enjoyed, I would like more information about this, because it is very nice.